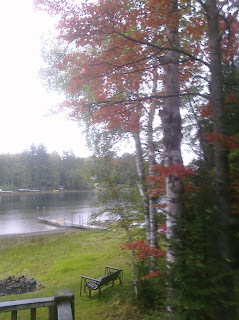 ... to a moderate rain and the beginning of fall color. Kudos to last visitors (Brian?) for excellent kindling supply. Fire was quick and cottage is warming nicely. Demerits to last visitors (Brian?) for failing to empty the ash tray. if you have a fire the night before you leave the cabin --leave the ashes in the stove(s)for next camper to dump as the ashes may still be hot with live embers. That is the rule I was following. It had been dumped the previous day when it was full. Uncle Harlan told me I did not make very good kindleing so I decided to prove him wrong. Glad it worked well for you. I hope you like the ax i purchased. When I got to camp all the ax handles were broken. Ok Brian. You are off the hook. I was unaware of this rule. Since a Shag Security Council member has vouched for you, your probation has been suspended.